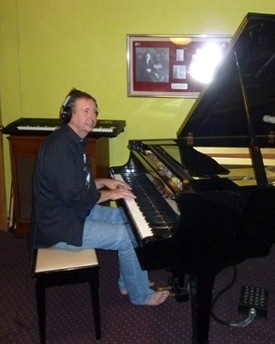 The last time I wrote, I was just about to fly to Melbourne for the Equinox recording of my new album. It gives me great pleasure to let you know that the final master of the album is now very close to completion – a few more tweaks to the mix and it is done! What an experience it has been. The personal journey of preparing for the recording, which I shared with you in my last newsletter, has continued, with similar if not increased intensity, as many of my own deep, core issues have come up for clearing and release. 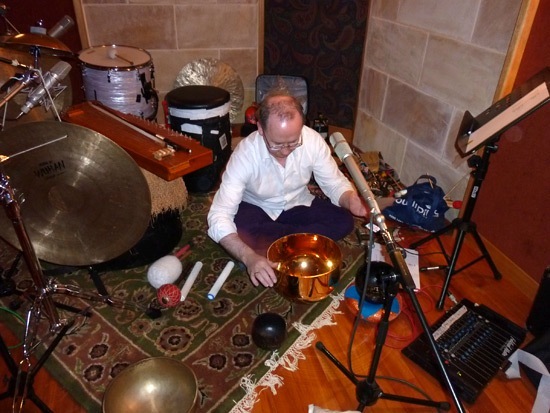 The Equinox recording in Melbourne was magical. I felt the presence of many of you with me as I too, consciously connected with many of the other sacred ceremonies taking place throughout the globe. 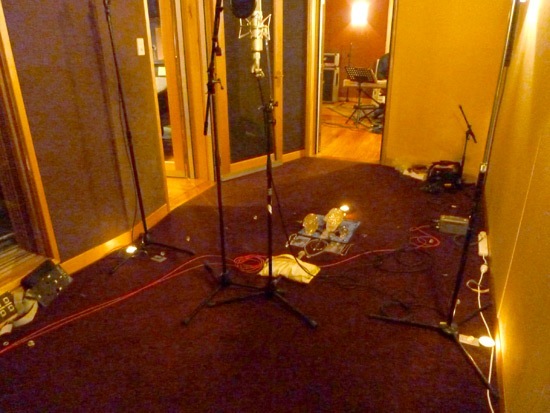 The iconic Sing Sing studios, which are considered to be the top recording studios in Australia, and the very accomplished engineer, Robin Mai, provided a beautifully warm and supportive environment, within which to bring these powerful energies through. 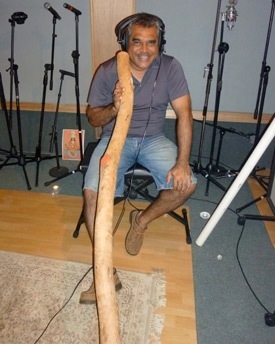 The additional recording at Pegasus studios in Cairns, where I’ve worked a number of times before, was no less synergistic. Musically, this album has been my most ambitious to date. Unlike most of the recordings so far, which contain one extended track, this new album has 10 separate tracks dedicated to the individual crystal energies. I feel so blessed to have been able to draw to myself, a group of really special musicians: Master Drummer and percussionist David Jones who was recently awarded the prestigious honorary Melbourne Prize for music; world-renowned Didgeridoo player, David Hudson who toured the world with Yanni for several years; award winning composer and keyboard player, Mark Mannock who has performed with the likes of Tina Turner, Joni Mitchell and Tommy Emmanuel; and two time Aria award winning (and five time nominee) musician, music producer and engineer, Nigel Pegrum. Apart from being at the top of their profession, each one of these men has contributed greatly to the overall magic of this project, through their total dedication and love of their craft, as well as their own individual and very special energies. 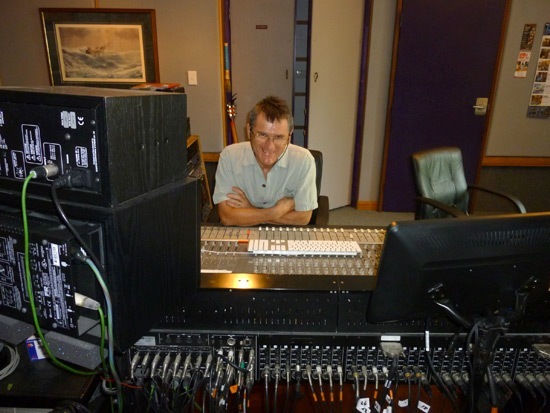 Nigel Pegrum at his control desk – Pegasus Studios, Cairns. 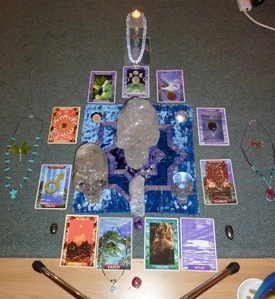 In both the Melbourne and Cairns studios, I was able cleanse the space thoroughly, and surround myself with my beautiful Crystals, Crystal skulls, and candles, and meditate on each crystal before channelling their message, through the Sounds of Sirius. The musicians and engineers totally respected my need for this process, and in each case, the environment could not have been more conducive to the task at hand. 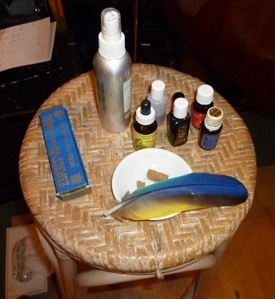 A beautiful aspect of this recording for me was being able to incorporate theactual sound vibration of many of the individual crystals, through the use of the Crystal bowls. 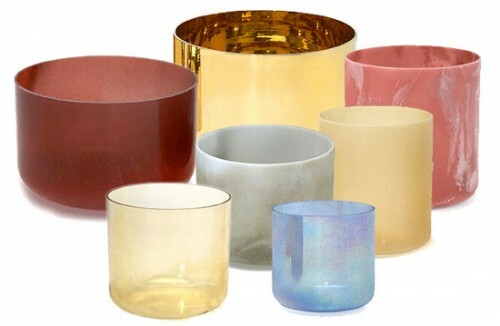 Clear Quartz crystal bowls have been part of the backing track of all of my albums so far. This time however, I had my new Advanced Alchemy Crystal bowl set, as well as other Alchemy bowls, sent from Sydney for the occasion by my dear friend Susie Nelson-Smith. The energies of the Crystal Devas carried within the exquisite crystal clear, sound purity of these beautiful instruments, is an integral and important part of the fabric of this album. Advanced Alchemy Crystal bowl setDay by day, the imminent birth of Crystal Keys into the world draws closer! One thing that became clear during the recording process, is that more crystals are calling to have their messages made manifest. Before flying to Melbourne, my intention was that this album would have 13 tracks. I thought this would be a lovely way to reflect the energy and symbology of the 13 Crystal Skulls of ancient legend and the concept of the 12 aspects of the 1 Universal Mind. When it came time to bring the energies through in the studio however, it was evident that my plan was not the Divine plan in this regard! The Crystal Masters wanted a bit more ‘airplay’ it seems! The album’s 10 tracks now have a running time of 67minutes. As a CD can only hold 70minutes of material, there was no way this album was going to have 13 tracks! The other Crystals are still calling to be heard so, depending on the reception this first album receives, it is my hope that a Volume 2 of Crystal Keys will follow. You may have noticed from my other eight albums, that I consider the cover and booklet artwork very important. For me, it’s paramount with this work, that each and every aspect of the energy be realized with as much perfection as possible. The covers of all my albums to date are original artworks and of course, I wanted no less for this new album. 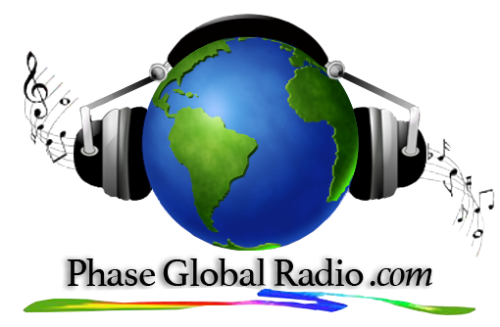 In a time when many are ready to awaken to a New Earth Consciousness, I believe that Crystal Keys – Songs to Awaken and Heal has come through to provide us with an exceptional new tool. 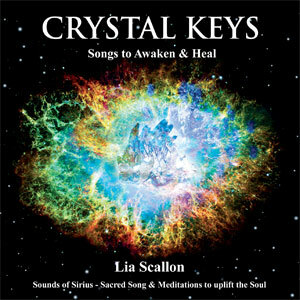 Embedded within the voice and the music are coded Messages of Light – Crystal Keys – to unlock the doorways to your heart and soul, helping you to awaken and heal at the deepest levels of your being. In ancient times these Light codes were available in the sacred sound chambers of Ancient Egypt and the legendary Crystal Healing Temples of Atlantis and Lemuria, where priests and priestesses used sacred sound to unlock the healing energies, information and Light held within the crystalline realms. These Crystal Keys are now available to us once more, through this powerful recording. As many of you responded to my sharing the beginning of this journey with you, and as many of you joined your energies with mine for the Equinox recording, I felt I should also give you a peek into the actual event! I hope you’ve enjoyed the journey! Lia Scallon For almost 20 years, the unique, otherworldly vocals of award-winning Composer/Singer Lia Scallon, have been transporting listeners to that sanctuary within the heart, where they can connect with their own wisdom and ability to heal. Lia’s music defies easy definition. The power of her sacred songs and accompanying ‘Language of Light’, belongs to the realm of Spirit. Many say the music reaches deep into their soul, triggering remembrance of their life’s purpose. Inspirational and transformative, yet profoundly soothing to body, mind and spirit, it could be said that the ‘Sounds of Sirius’ are calling you ‘home’. 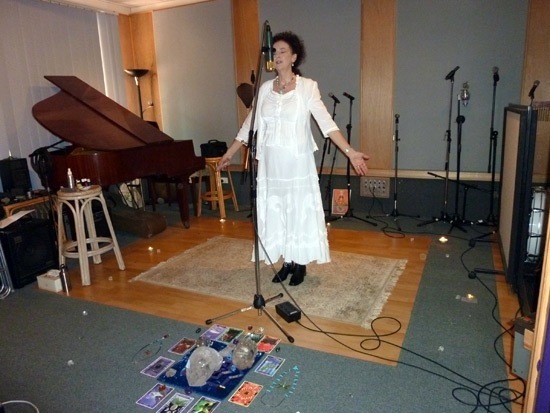 Lia’s three most recent albums – Crystal Keys, The Luminous Pearl, and Song of the Sidhe, have all received worldwide recognition, and been honoured with multiple awards.